Its been a long time since I've been really excited to read a book. This one in particular. For those unfamiliar, Gwendolyn Kiste is a rapidly rising star on the indie horror scene. Over the last few years she has published many, many stories in all the top horror and speculative fiction magazines such as Black Static, Interzone, Nightmare Magazine, Lamplight, Shimmer and Sanitarium Magazine. Recently she published her first collection of short stories with JournalStone, And Her Smile Will Untether the Universe which contained previously published stories as well as a few originals. Upon release it instantly garnered high praise from many reviewers and readers all over the world. Since then she has written her first novel The Rust Maidens which will be coming out 2018 with Trepidatio Publishing. There is also a novelette in the works which she has co-written with Emily Cataneo who also has a great collection out with JournalStone, Speaking to Skull Kings and Other Stories. Pretty Marys All in a Row focuses on the famous Marys found in our modern urban legends and ancient folklore. Are they really as harmless as they seem? Made immortal in childish nursery rhymes and creepy campfire tales they are brought back to life in this tale. "We don't know how we got here, and we don't know how to leave." First we have Resurrection Mary, a young girl who haunts the highways at night hitchhiking her way with fear. There's Bloody Mary who will appear in a mirror if you say her name three times, next we have Mistress Mary Quite Contrary, Mary Mack who endlessly builds her own coffin and finally Mari Lwyd. Each evening they gather to feast, not on food but on fear which they hunt for. Apart from that they are mostly solitary creatures carving out an existence not knowing who they are, forgetting what they were and how they came to be here. They adhere unquestioning to strict rules and regimented routines from which they never deviate. That is until their way of life is threatened. They are no longer alone, there is a voice in the darkness. Rhee aka Resurrection Mary fights back and soon begins to question her entire existence. Who has imposed these rules on them and are they more powerful than the Marys? Soon they realise they are stronger together than apart but is their power enough? 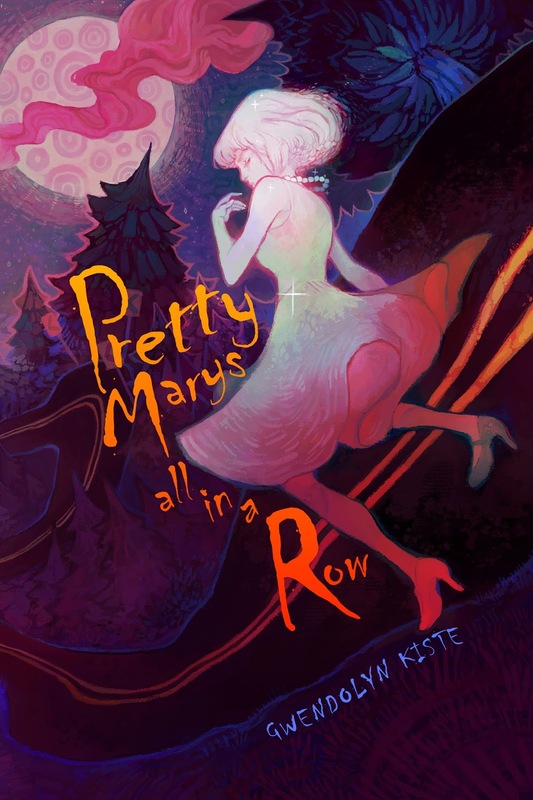 Pretty Marys All in a Row is a ghost story mingled with folklore and urban legends. It really delves into the life of a ghost and what it means to be alive and free. Again, like with all her stories the writing is wonderful, dark with a literary edge. She adds beauty to dark stories. Her masterful command of prose is deeply evocative you really feel like you are there with Rhee standing on the highway. I love the thinking behind the story, its really out there offering a really fresh perspective on tales we all take for granted. Pretty Marys All in Row is deeply moving. It is a story of survival after tragedy, of never giving up and finding the strength within you. It is also a very haunting tale, of not knowing what is out there beyond our mortal world. This is a tale you will want to read again and again. After reading this, I simply can't wait for more tales from Gwendolyn Kiste! Gwendolyn Kiste is a speculative fiction author based in Pennsylvania. Her work has appeared in Nightmare Magazine, Shimmer, Interzone, Lamplight, Flash Fiction Online and Three Lobed Burning Eye as well as Flame Tree's Publishing's Chilling Horror Short Stories anthology, among others.